In 1936 King King Edward VIII abdicated the throne, forcing his reluctant brother to take his place and become King George VI. Thrust into a new media world where monarch’s are expected to make stirring speeches via the radio, King George battles with his stammer - something he cannot get to grips with no matter how many marbles he is forced to stick in his mouth. Then he meets an unorthodox Australian speech therapist who, while helping him with his stammer, soon becomes a true friend. 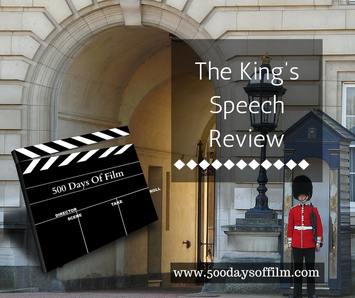 I don’t think that it will come as any surprise when I report that The King’s Speech is a very good film. It was a phenomenal success at the cinema, with many people returning to watch it over and over again. All of the central performances are superb. Lionel Logue (Geoffrey Rush) has to view King George (Colin Firth) as an equal - as a man and not a King - in order to treat him. The resulting friendship that develops between them is really lovely and is, of course, the heart of the film. Director, Tom Hooper, manages to portray the difficulties that King George faces as a result of his stammer so well. The scene early on in the movie when he struggles to speak into the microphone is very tough to watch. The King’s Speech tells a powerful, and often upsetting story but the friendship between Bertie and Lionel leaves you feeling uplifted. The 12 rating of this film caused a bit of controversy given the swearing that takes place. However, the BBFC decided to keep the rating at a 12 given that the swearing is all in a speech therapy context. Another fantastic performance from Helena Bonham-Carter. After watching, I am so aware of how I speak. Quite jarring that King George is encouraged by his doctors to smoke in order to calm his nerves and increase his confidence.